Googling around, all I find is the predictable political carping (the left: “he looks damn good in that jacket”; the right: “he’s a sellout for appearing in a jacket ad”), so my chances of finding out exactly how this came to be ae essentially nil. Unless anyone reading this knows?!? UPDATE: The sign has been removed, and replaced with a very clever alternative. 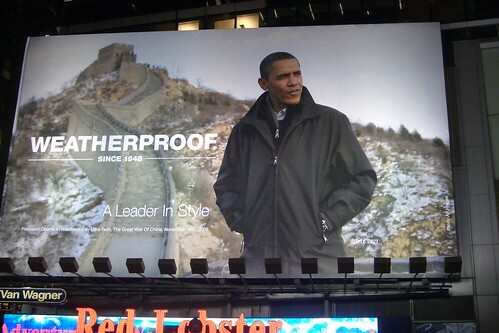 Bravo, Weatherproof. Bravo. What I heard (on NPR? not sure) was that he knew nothing about it until it went up, and that the White House immediately asked them to take it down, because it indeed wasn’t appropriate for a sitting president. Is it still there? I took that picture last week, so unless they took it down very recently, yes – it’s still there. I read in the NYT a few weeks ago that the company agreed to take it down after the White House contacted them … I’m surprised that it’s still up. Thanks, Mike. First of all, I love the fact that my photograph of it is better than the New York Times’ shot. If we were to get a letter or a call from the White House saying they didn’t approve of it or they didn’t like it or whatever, or they see it as an ad, we’ll do whatever we have to do. We’re not looking to alienate the White House.